Create a sophisticated and stylish seat in your formal dining area. This exposed wood Parson's chair is available in three different fabrics, Camel, Chocolate and Beige fabric colors. A tufted seat back and cushioned seat is featured for superior comfort and a fashionable appeal. Exposed wood tapered feet add a beautiful finishing touch. 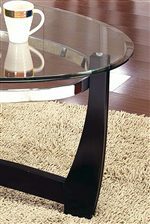 Pair with the glass top dining table to create a contemporary dining room experience. The Matinee Exposed Wood Parson Dining Chair by Steve Silver at Walker's Furniture in the Spokane, Kennewick, Tri-Cities, Wenatchee, Coeur D’Alene, Yakima, Walla Walla, Umatilla, Moses Lake area. Product availability may vary. Contact us for the most current availability on this product. Fabric Options Fabric is available in Beige, Camel and Chocolate colors.